Most pet owners are aware of the importance of bringing their dogs and cats into the local veterinary clinic in Dartmouth for regular check-ups, vaccinations and other treatments to prevent small issues from becoming big health problems. Unfortunately, many pet owners are not aware of the importance surrounding good canine dental care and feline dental care. While it might sound like a service that only wealthy pet owners can afford, your Southeastern Massachusetts veterinarian at Anchor Animal Hospital provides these beneficial services to pet owners from all walks of life. Why is Veterinary Dental Care Important? A quick search online will expose you to countless stories of pet owners who went through horrible situations with their cats and dogs as a result of dental-related issues. Similar to what can happen with humans, pets that have untreated dental issues can end up suffering from bigger problems, such as extreme inflammation, infection and other progressive conditions. Not only will a lack of proper canine dental care and feline dental care lead to issues that can make it difficult for pets to eat and get the nutrition that they need, but it can lead to dental disease and, in some cases, even death. Dental disease is becoming even more common in cats and dogs than ever before. Untreated dental conditions can lead to bone loss, organ damage, jaw fractures and kidney disease as a direct result of the spread of oral disease throughout the body. Your trusted Southeastern Massachusetts veterinarian at Anchor Animal Hospital can share with you information about simple cleanings, extractions and other treatments that can be done to prevent small dental issues from turning into big life-threatening conditions. According to a study published by the ASPCA, gum inflammation is very common in cats. In fact, lack of feline dental care has resulted in approximately 75 percent of adult cats requiring extractions to correct problems that could have been avoided with preventative treatments. The study also reveals that adult dogs are most often victims of broken teeth and advanced periodontal disease. Again, this could be avoided through the application of basic canine dental care and regular check-ups at your local veterinary clinic in Dartmouth. 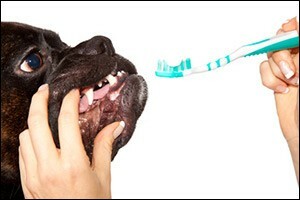 You can begin getting your pet on the road to healthy teeth and gums by brushing their teeth regularly. According to veterinary dental experts, there is absolutely no substitute for regular brushings. Even the so-called “dental treats” that have become popular in recent years are no match for brushing with special toothbrush and toothpaste kits for cats and dogs. You can get them through your Southeastern Massachusetts veterinarian or at your local pet store. In addition to brushing at home, you can make sure that your cat or dog has a healthy diet. Crunchy food helps to clean and remove tartar build-up from teeth, whereas “wet” food can accumulate between teeth and gums to increase bacteria and lead to dental disease. Speak with your vet at your next appointment about smart diet and treat choices that will help keep your pet’s mouth clean and healthy. Schedule dental check-ups from puppy to about seven years old and, in their senior years, get check-ups twice each year to monitor any changes that could be occurring. When it comes to getting proper canine dental care and feline dental care for your dog or cat, the important goal is to focus on good dental health and not cosmetic issues. Extractions of bad or unhealthy teeth can help your pet feel better. While some people may worry that the pet won’t be able to eat properly with the missing teeth – or chew on a favorite toy – the truth is that the pet will feel much better after the bad teeth are gone. Contact your local Southeastern Massachusetts veterinarian at Anchor Animal Hospital in Dartmouth for more information about canine dental care and feline dental care for your pet. You can call to schedule an appointment for a check-up or to get more information on brushing, dental exams and other ways to help keep your pets healthy. Give us a call at 508-996-3731 and help get your pet on the road to a long and healthy life today!